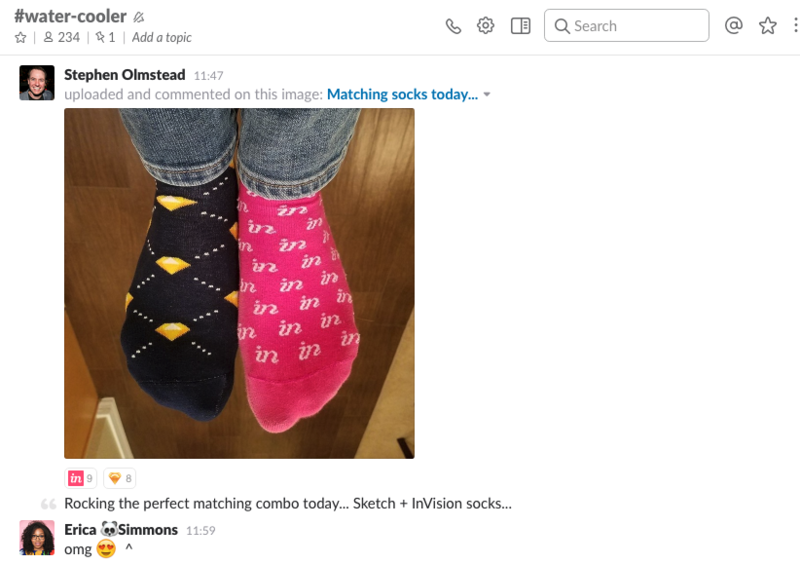 At InVision, we ❤️ Slack. Building a design collaboration platform at our fully remote company—with team members in 19 countries and nearly 100 cities around the world—requires a lot of communication and shared vision. Slack allows for plenty of customization through bots, channels, feeds, and emojis. 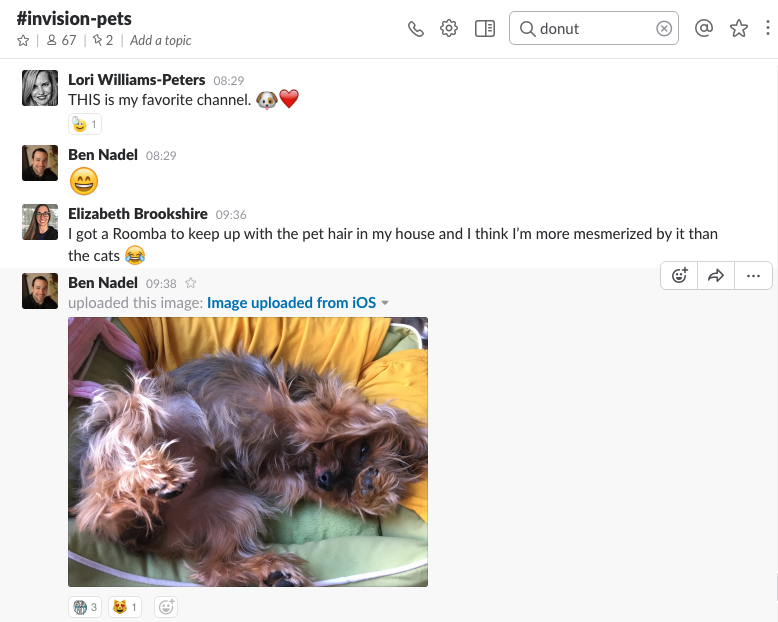 As a company full of creative people building tools for product teams, it’s hard to resist making our Slack installation our own. Emojis and GIFs add crucial context to text-only communication. As a remote team, visuals help us express ourselves and be understood faster —and our custom InVision emojis add a whole new layer of inside jokes and team context. It helps that emojis and GIFs are just so darn fun. We take advantage of the /GIF command and a suite of auto-response GIFs to insert the perfect lighthearted GIF for every moment. 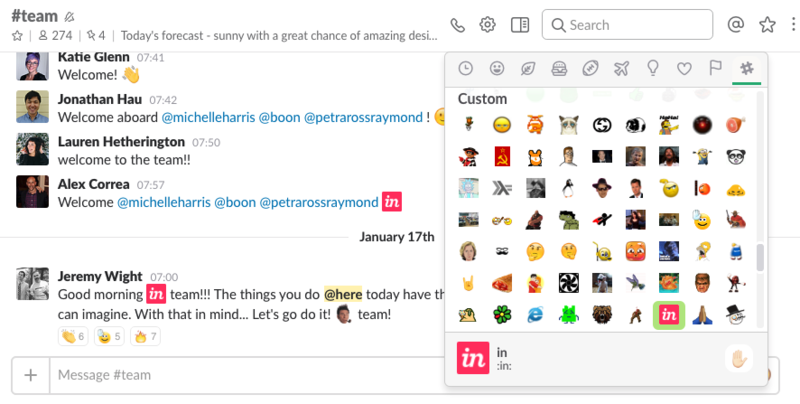 We have more than 1,150 custom emojis in our InVision Slack—everything from a dancing neon parrot named :partyparrot: to illustrations of memes like Grumpy Cat and Success Kid. With a Slack integration, we can send and receive Bonusly instantly from any channel. A dedicated #bonusly channel tracks everyone’s gratitude. Did I mention that Slack is the heart of our communication? It’s also our central brain, in many ways. We track feeds and send all kinds of intelligence straight to our dedicated channels. This helps us keep everyone in the loop, share curated and relevant news, track deals, and more. As a fully remote company, we can’t meet around the coffee machine or ping pong table to discuss the latest episode of Westworld (though many InVisioners take advantage of WeWork spaces in hub cities around the world). 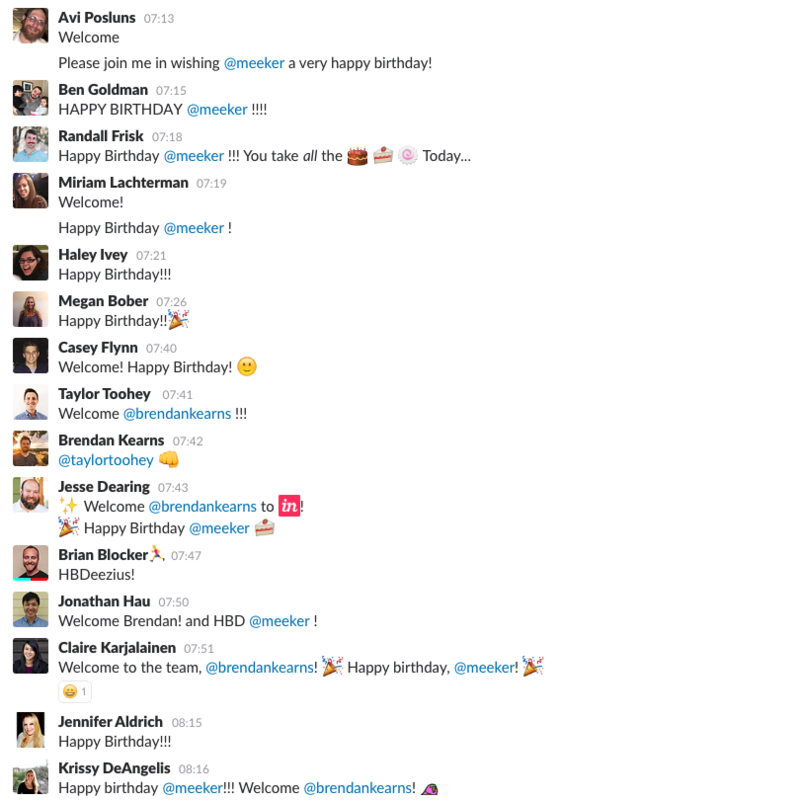 Enter Slack, the water cooler of the future. Our aptly named #water-cooler channel is for everything fun, including our VP of Partnerships’ incredible sock combination. At more than 260 employees, we’re tackling the challenge of staying connected as we grow. Recently, we started using Donut with Slack to introduce us to fellow InVisioners, round-robin style. Members of our #yaynewfriends channel get a random direct message connection to a colleague every week. Of course, the best interactions spring up naturally around shared interests. We have more than 350 topic-specific channels, including ones for books, beer, fitness, and pets (we love our pets). We get asked how our company Slack became such a reflection and extension of our culture. “Don’t force it” isn’t the same as “let everyone do whatever they want.” Be clear about the rules, and address potential problems head-on. For people new to Slack, it’s easy to imagine constantly bouncing from one direct message to another—and productivity plummeting as a result—so ensure your guidelines address that. At InVision, we have “online” hours between 10 a.m. and 6 p.m. Eastern, where all team members are expected to be logged in. We’re not required to respond immediately to every Slack message during that time, and that’s made clear. Team members use the Slack notification snooze and Do Not Disturb features to get work done without interruption. We also rarely use the ping-everyone-in-the-company @channel command due to our different time zones—we default to @here if we need to get everyone’s attention. Guidelines around etiquette considerations like these can help your people feel confident jumping into Slack from day 1. Once you’ve addressed ground rules and etiquette—release your team’s creativity. Let everyone come up with channel ideas. 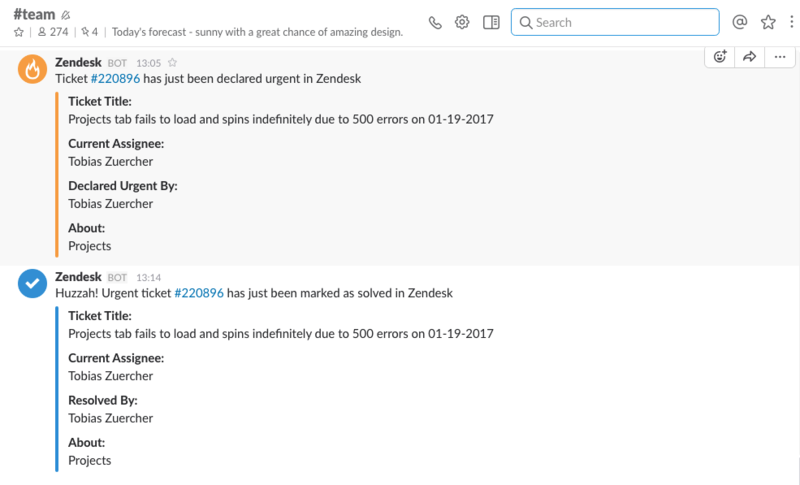 Trust your teams to use Slack in ways that make sense for them (for instance, our engineering team has created bots to help with pushing and logging). Let your people create channels for things they love, like learning design, books, pets, sports, fitness, and more. This gives them an instant community of colleagues with similar interests and way more reason to engage than if the channels get decided on-high. When we hear about company Slack instances sitting empty and sad, most of the time it’s because initial enthusiasm peters out and people fall out of the habit of chatting about anything but work. Designate a few people to be “conversation starters.” We have certain people who are responsible for making sure birthdays get recognized or new people get introduced, for instance. Encourage your more social teammates to be themselves on Slack, asking questions and staying active in team channels to draw others out. While having department-wide channels like #marketing or #product can be useful, you might find that sort of broad brush approach to be too generalized for how your team actually works. At InVision, some teams (marketing, for example) create specific channels to align with individual project structure. If we have a project dedicated to building out a library of case studies, the “pod” team on that project gets their own dedicated Slack channel—#case-studies. Doing this gives project-related conversations context, and helps our team members—many of whom are on multiple projects and teams—keep things straight! 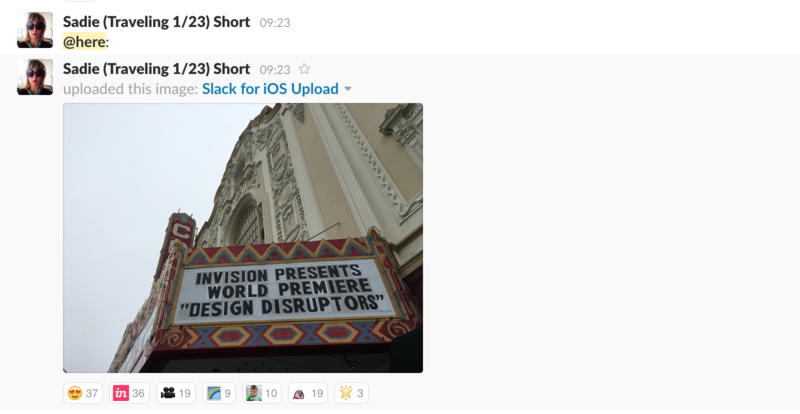 InVision + Slack = ? ? Our love of Slack goes beyond the product. We admire and share in their vision to build the future of work, helping teams work smarter and better. 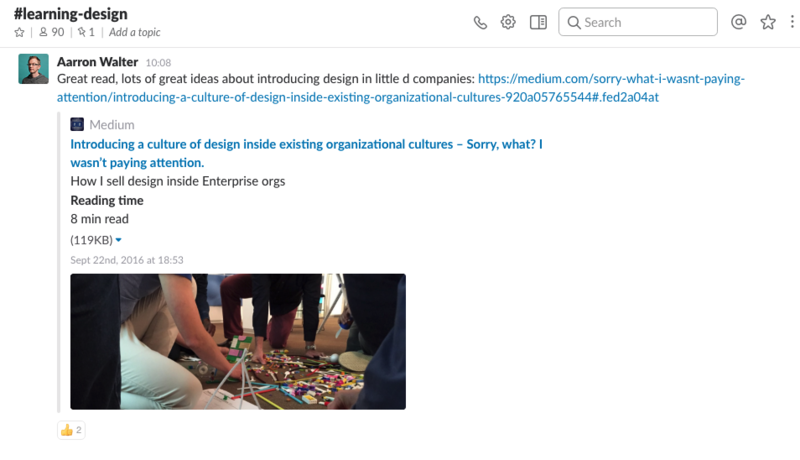 Slack reduces noise and removes unnecessary steps to streamline communication while adding all the right things to our culture—fun, visibility, creativity, and heart. We can’t wait to see what we’ll do together next. Automatically sync all your InVision project changes to Slack. 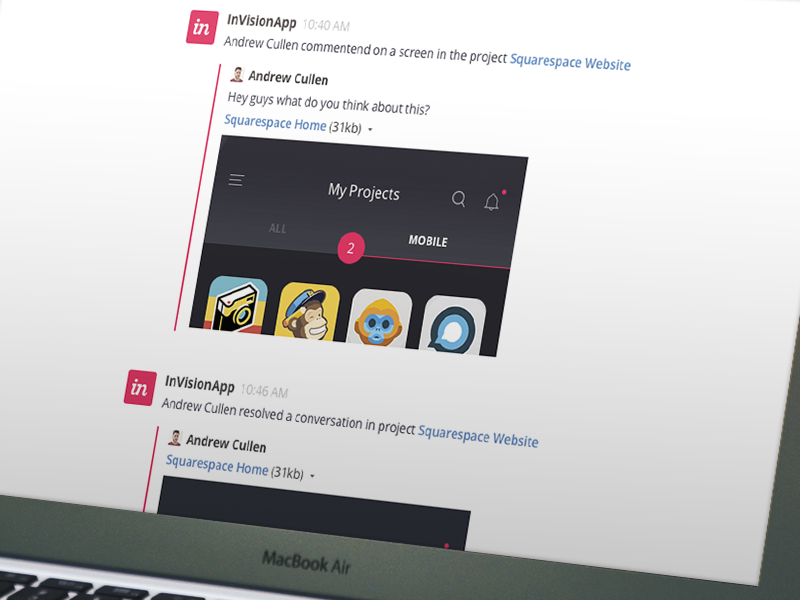 Try InVision + Slack.